Laurie, one of our long-time HardBody members, told me she had a friend that really wanted to try Body Project, but she was nervous to start. I met with Laurie’s friend Karyn to chat about her goals and to tell her more about Body Project and to see if we were a good fit for her. – She was also nervous that she wouldn’t be able to commit to our program, even just 3 times a week. – She was used to being frustrated and I could sense she was even a bit skeptical because she had been burned by so many workout programs and diets in the past. – Karyn was nervous to start. She hadn’t exercised in a while and she was afraid she wouldn’t be able to keep up. – Karyn, though she didn’t say it, seemed almost guilty for spending the time and money on herself…like so many other women, we have a hard time justifying spending time or money on ourselves. – BUT Karyn knew that she had to do something…she was sick of the way she felt and the way she looked. After years of taking care of 3 kids and everyone else…she had let herself get to a place that left her frustrated and lost. – I did a body composition analysis for her so we knew her starting point which would allow us to and design a program that would work for her and chatted about a few simple changes to her daily diet she could easily incorporate. Karyn came as a guest to try out one of our HardBody workouts. …that first session is the hardest because we always fear the unknown. Karyn felt this way too…unsure and a little nervous…but knew she had to take that first step to see progress and results. I emailed Karyn to check-in and see how she was feeling after her first workout…giving her a few tips to help with the initial soreness and tightness. “See you tomorrow! ?” YES! I knew she just needed that one session to get her feeling like there was hope and results for her to be excited about! Her journey was just beginning as she started her first 4-week KickStart program with us. After her KickStart program ended, she decided to join as a HardBody member and was able to experience her first BP 6-Week Transformation. And her mindset is like she’s a completely different woman…actually…not different…just the BEST version of Karyn! Even though she was scared and nervous, she knew the consequences of doing nothing were greater than her fear itself (and she quickly realized how much fun it is to be part of Body Project!). 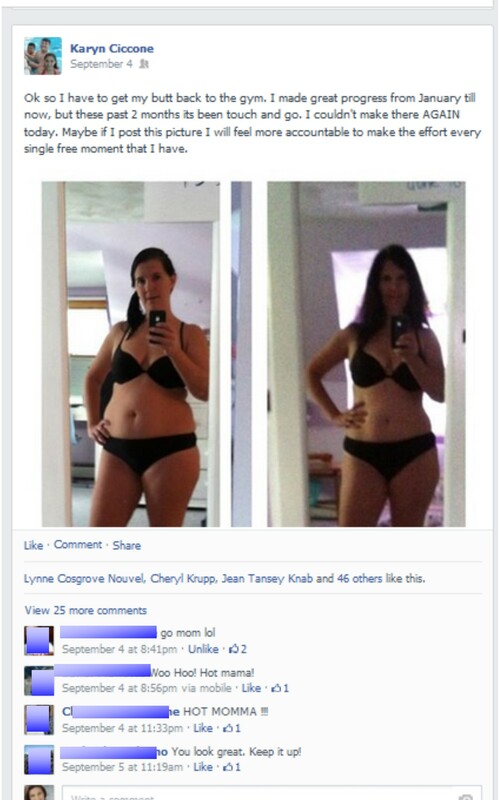 Last week, Karyn posted this before and after picture below on Facebook…and my jaw dropped (I couldn’t believe she had the guts to post it!)! I couldn’t believe she posted this! And she posted it because she wanted to feel accountable to getting back on track…and honestly…I think her starting her workout program was probably scarier than posting this picture! Like many of us, summer happens, life happens…and working out and eating right sometimes get pushed aside. But it’s NEVER too late to get back on track…and the difference now from that first meeting on January 3rd was that over the course of less than a year, Karyn realized that she is capable of so much more than she probably ever imagined…and giving up is just not an option! SOOO – let’s all be inspired by Karyn. I challenge you to do something bold; something that may scare you a little! Take an action that you know will make a difference in your life. And once you accomplish it, you’ll wonder why it took you so long to do! – Go ask your boss for a raise or that new position you believe you’re qualified for. – Register for a 5K or a competition like a triathlon (like an inspiring group of our HardBody members did last weekend!) that will challenge you to stay disciplined to achieve a goal. – Take a leap of faith and follow that dream of yours that you’ve been putting off for years. – Sign-up for our Fall 6-Week Transformation program like Karyn did and commit to a complete fitness and lifestyle transformation…and if you’re just not sure it’s right for you…take the action and just call us (calling us won’t hurt you!). No one ever achieved anything great by being comfortable…so get comfortable being uncomfortable. So…what will you do that scares you today? Will you let yourself be your own enemy and keep you from achieving something great? What’s the opportunity that is waiting for you…that all you need to do is just accept? …and the best part is…you’re not alone! You have this community of kick @$$ women who are all here to support you even when it feels really uncomfortable! P.S. Of course I received permission from Karyn to share her story and photos…and she was thrilled to share her journey!